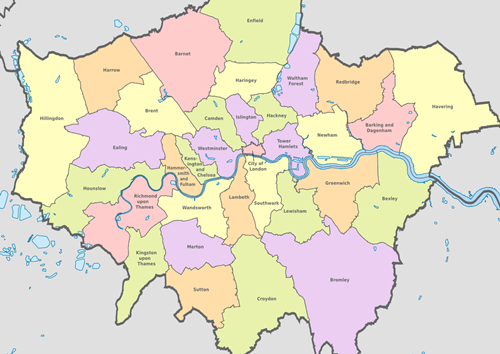 List of London boroughs – London is the capital city of England and the United Kingdom (UK). It is the most populous city and the largest city in England. London also referred to the metropolis around this core which makes up Greater London. Geographically, Greater London have 33 small cities or borough, divided into inner London boroughs and outer London boroughs. Before 19th century, London only refers as city of London, but today the term ‘London’ also referred to Greater London. Greater London is a region of England which forms the administrative boundaries of London. Currently, Greater London consists the city of London and 32 small cities, usually referred as boroughs. Together there are 33 local government districts in Greater London. Each borough has their own governments, schools, centres, suburbs and sense of identity. All 32 London boroughs divided into two category, which are inner London boroughs and outer London boroughs. Inner London boroughs form the interior part of Greater London and are surrounded by outer London boroughs. Below, we provide list of borough in London, including 32 London boroughs (inner London and outer London) and the City of London. This list is arranged by largest boroughs in London by population size. *reader note : City of London is not a borough, it is governed by the City of London Corporation, but is an inner London council. Those are full list of borough of London, consists of the city of London and 32 London boroughs (inner London and outer London). Croydon is the most populous borough in London, while Kensington and Chelsea is the least populous (if we exlude City of London).